"Some lies just have to be told." 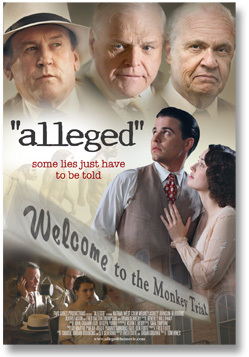 Alleged is a romantic drama based on events using both historical and fictional elements occuring behind the scenes and outside the courtroom of the famous Scopes "Monkey Trial" of 1925. Charles Anderson, a talented young reporter, feels trapped working for his deceased father's weekly newspaper and living in a tiny town in steep decline. Seeing the "Monkey Trial" as a once-in-a-lifetime opportunity to break into the journalistic big leagues, Charles manages to insert himself into the middle of the "Trial of the Century." Once in the midst of this staged event, however, he is torn between his love for the more principled Rose, his fiancée, and the escalating moral compromises that he is asked to make as the eager protégé of H.L. Mencken, America's most colorful and influential columnist.